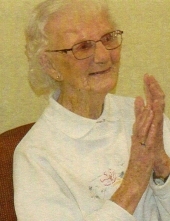 It is with great sorrow for the family of Mildred Mawhinney –Pelrine announce her passing on February 4, 2019 at the age of 93 years. Micky, as she was known, came to Canada from Yorkshire, England as a War Bride. She has lived in Nova Scotia, Ontario and in 2012, Micky moved to Okotoks to be with family. She is survived by her fiancé Jack Martin, her five sons: Dave (Maxine), Brian (Christine), Ken (Diane), Robert (Susan) and Don (Linda). Three step daughters: Judy, Sheila and Carole. Twenty-one grandchildren, Thirty-three great grandchildren, and two great, great grandchildren. Micky will be deeply missed by all the lives of those she has touched. She will live on in the hearts of her family. As to Mildred’s wishes no funeral service will be held. To send flowers or a remembrance gift to the family of Mildred Mawhinney-Pelrine (nee Mitchell), please visit our Tribute Store. "Email Address" would like to share the life celebration of Mildred Mawhinney-Pelrine (nee Mitchell). Click on the "link" to go to share a favorite memory or leave a condolence message for the family.